Movement is part of what makes your life complete. In 2017 FitLabPGH brought you 3 YouTube/Instagram videos each week with movement tips and lifestyle hacks. Not everyone is an athlete, but everyone can move and make movement a regular part of life. 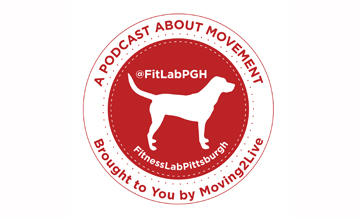 Have fun with movement and check out all our podcast episodes with interviews of people in the PGH area…get some more ideas for movement from our 2018 interviews. Three times a week Movement Tips and Lifestyle Hacks on our YouTube channel: YouTube and on Instagram This week Menachem Brodie of Human Vortex Training gives us 2 tips and a reminder video to enjoy movement as part of a healthy lifestyle…for stress relief and fun too!! New videos next week, but no new podcast episodes until 2018 (in less than 2 weeks). This week talking about a home suspension trainer, an outdoor adventure and a tip from our upcoming podcast interviewee, Coach Menachem Brodie of Human Vortex Training…all designed to remind you that movement is part of what makes life complete!! 2) It’s Beginning to Look Like the Holiday Season in PGH…But You Can Still Get Outside & Move! Justin Berthold, DO, is Board-Certified in Physical Medicine and Rehabilitation. Dr. Berthold was born and raised in Forest Hills, PA. He received his specialty training in Physical Medicine and Rehabilitation from the University of Pittsburgh Medical Center (UPMC), and then formed the Rehabilitation Physicians of Pittsburgh with Timothy M. Burg, DO, to provide the highest level of care to his patients. In addition to his clinical practice, Dr. Berthold is on the faculty of the Lake Erie College of Osteopathic Medicine (LECOM) at Seton Hill and also serves as the Senior Medical Director of The Children’s Institute. To learn more about Dr. Berthold, Dr. Burg, and Rehabilitation Physicians of Pittsburgh, visit www.rehabpgh.com or connect with them on Facebook using the link below. This week an idea for a quick easy meal and two unique ways to help make movement a part of your life, even during busy times. The South Park Trail Runners is a Facebook group for people interested in running trails in the South Hills of Pittsburgh. The Facebook Group was created to provide a platform for people to schedule runs on South Park’s single track trails and to provide an opportunity for folks to meet and get to know others with the common interest of trail running. The Facebook Group is a forum to post when you want to run, a time, a location, distance and any other information you think is relative to the run. No membership required just the desire to explore the trails in South Park! We spoke with founders John Warrick and Suzanne Natter, both Pittsburgh area natives and avid trail runners. To learn more about the South Park Trail Runners, visit their Facebook page using the link below. James Fuller Fixx aka Jim Fixx (April 23, 1932 – July 20, 1984) was an American who authored the 1977 best-selling book The Complete Book of Running. He is credited with helping start America’s fitness revolution, popularizing the sport of running. Highlands Sky Trail Run- 40 mile ultrarun across Roaring Plains, Dolly Sods and Canaan Valley in West Virginia. Presented by Allegheny Trailrunners Inc. This week a few reminders that no matter what the weather #optoutside and enjoy the fresh air. Try out some resistance training activities on your deck or patio. A reminder– we are back with a new podcast interview this Sunday- South Park Trail Runners! !